Kham is 51 years old and prior to his accident he was a farmer, married with two children. Kham also had previous experience working as a masseur in Thailand. In December 2004, Kham was injured in a UXO accident which occurred when he was digging a water channel to his rice farm in Paxai District. Shrapnel injured his face and chest and he was blinded in both eyes. He was treated at the Provincial hospital for 28 days. A few months later his wife divorced him and moved away. Kham then lived with his niece. Kham’s son is a monk and lives at the temple and his daughter moved away after she was married. Over the 10 years since his accident, Kham had not sought or received help of any kind to improve the quality of his life. QLA met Kham for the first time in November 2014 when conducting a survey in his village. Later in November QLA arranged for animal raising training to be held in Kham’s village as part of a project funded by EU/MAG. Kham attended along with the husband of his niece. After the training Kham received a small grant to buy animals and he used it to buy a pig and three ducks, which his niece is helping to raise. 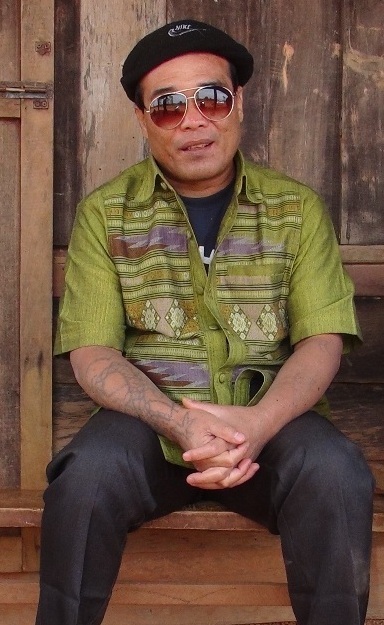 In December 2014, QLA arranged for Kham to come to the Provincial Rehabilitation Centre in Phonsavanh, where he received a white cane and some training in how to use it. He finds the cane very useful and uses it every time he goes outside. Shortly after, Kham attended his first meeting of QLA members (UXO survivors) in Phonsavanh. Like many UXO survivors, just to be away from their village for a couple of days is an adventure. For Kham, this was his first opportunity to meet other UXO survivors and experience peer to peer support and know that he is not alone. He had good conversation and fun with more than 30 other UXO survivors. He participated in a trivia quiz (amongst other things) which included fun questions and also questions about disability rights, which really got the discussion going. 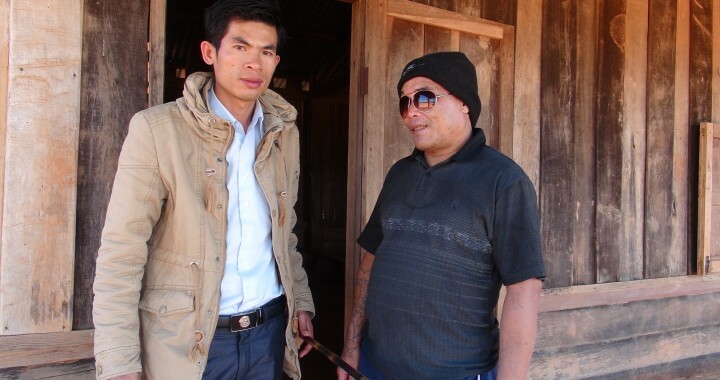 At that time, Kham also met Mr. Lue Ha, a blind UXO Survivor who works as a masseur in Xieng Khouang. Shortly afterwards, QLA facilitated a further meeting for peer to peer support between Kham and Lue. They also discussed the techniques of a blind masseur, which really raised Kham’s spirits, because of his previous experience as a masseur. QLA has since funded Kham’s trip to Vientiane where he is now studying at the School for Blind Masseurs. Because of this previous experience, Mr Kham is already able to earn income through massage while still studying. He is very busy and has many customers. He told QLA he has made many friends and said that his life is much happier than before. Kham plans to stay in Vientiane until he completes his study, after which he will return to Xieng Khouang to work as a masseur.